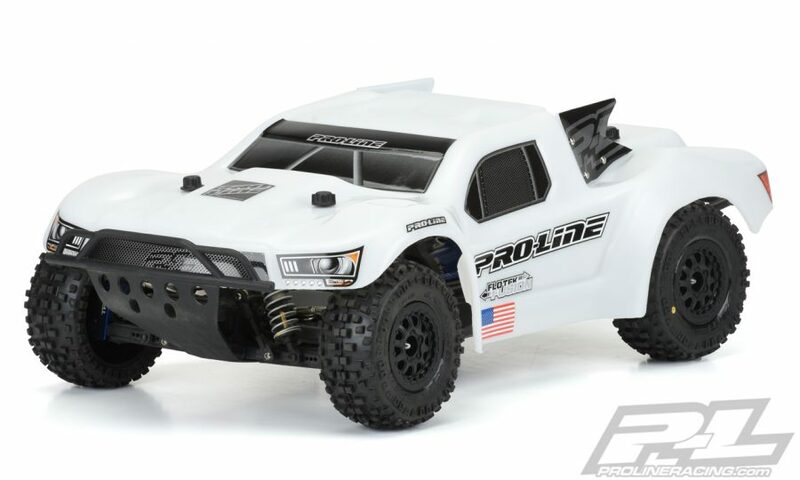 Quite recently, Pro-Line released its own short course truck, the PRO-Fusion SC 4X4. 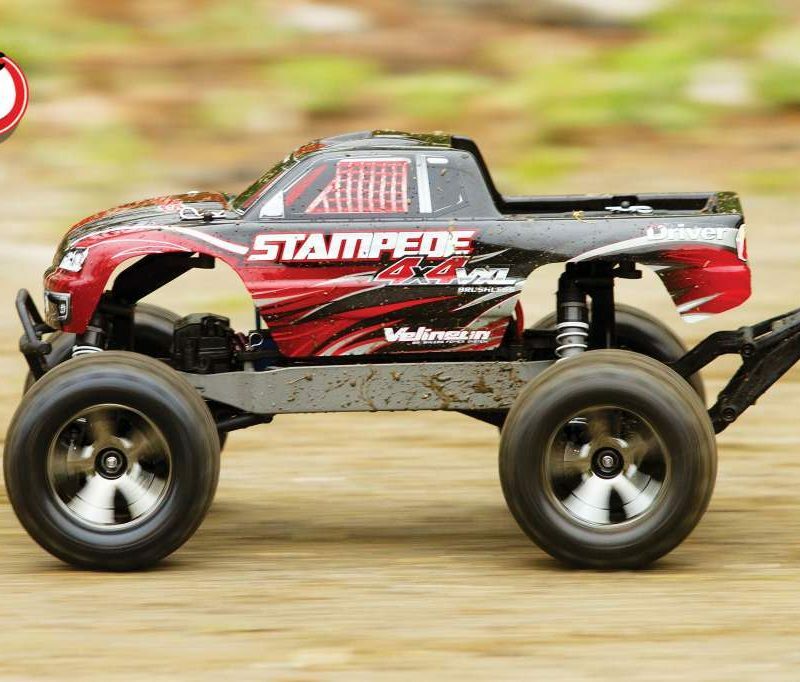 It is based on Pro-Line’s proven PRO-MT 4X4 monster truck platform and was designed to provide exceptional durability and performance thus making it a very versatile short course truck. The crew at Pro-Line applied its impressive 35 years of experience in manufacturing high-quality RC parts to make the PRO-Fusion the ultimate go-anywhere and do-anything 4X4 short course truck. 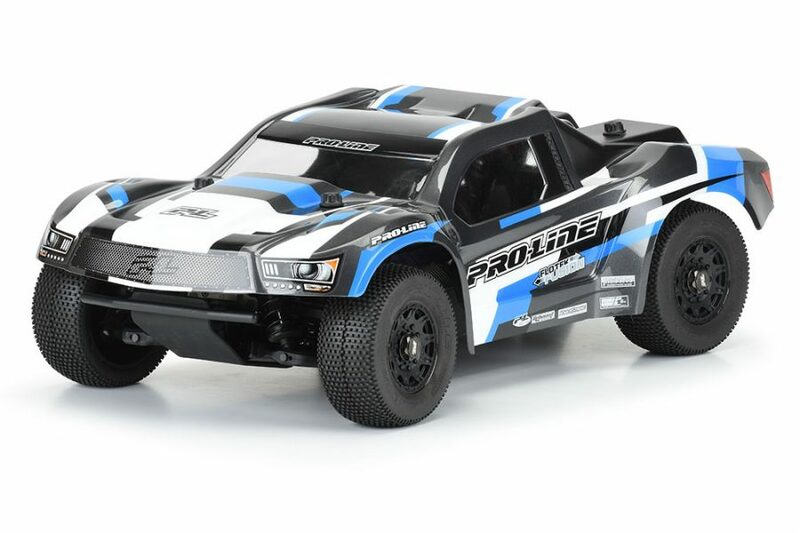 The Pro-Line PRO-Fusion SC 4X4. With that being said, we thought it would be cool to show you three build variations that you can create with the Pro-Line PRO-Fusion SC 4X4. 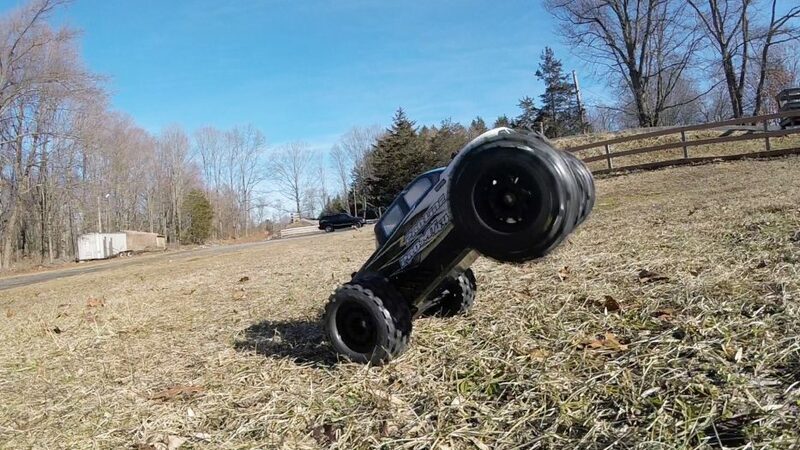 The first build is taking the PRO-Fusion and making it a short course race truck that is nearly bulletproof…perfect for practicing on a SC track and you won’t have to worry about damaging your truck. The next option takes the PRO-Fusion to the street with a scale-looking on-road ride that is built for speed. 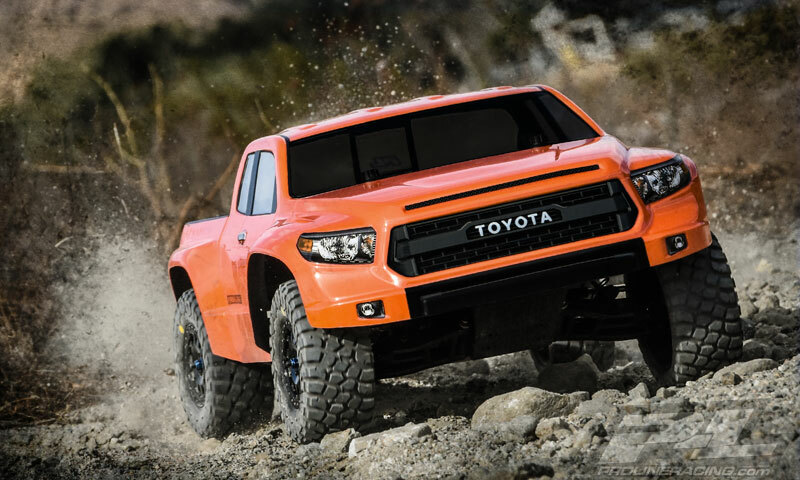 Lastly is a Baja desert inspired truck which can handle the rigors of off-road terrain while also looking the part. This article shows just three of the numerous build variations that you can create with the Pro-Line PRO-Fusion SC 4X4 truck. It is a perfect truck platform to be customized however you want it to be. 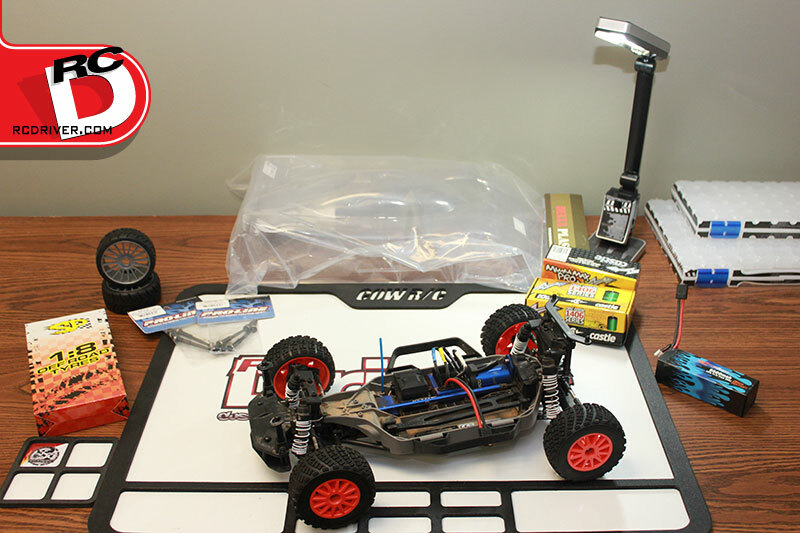 Build number one takes the Pro-Line PRO-Fusion SC 4×4 and outfits it for racetrack duty. The goal here is to make the PRO-Fusion as tough as possible. It is commonly accepted that wheel time is key to mastering your short course truck especially if you like to race. The downside of practicing is the damage that can happen to your ride as you get the hang of it and the track you are trying to learn. 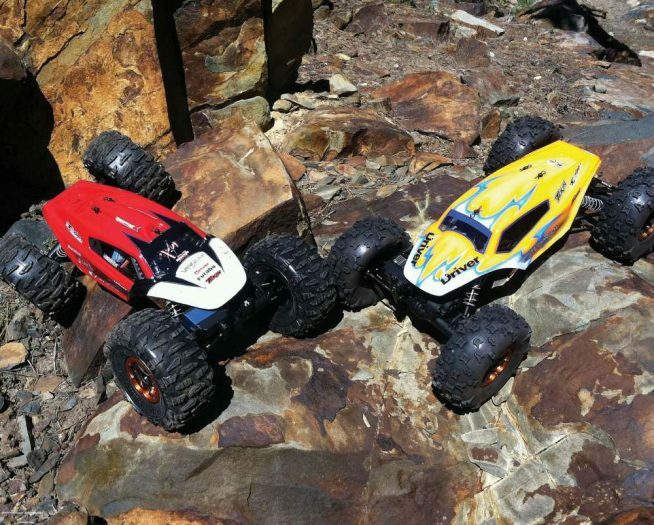 One of the big benefits of the Pro-Line PRO-Fusion SC 4X4 is that it was designed to be incredibly durable so it can withstand the majority of the tumbles and crashes that occur when racing. Pro-Line Pre-Cut Flo-Tek Fusion Bash Armor body (3458-15). A weak link is the body if you use a standard polycarbonate shell. The remedy and a way that you can add another layer of protection is with one of Pro-Line’s bodies made from Pro-Line’s all-new Bash Armor material. 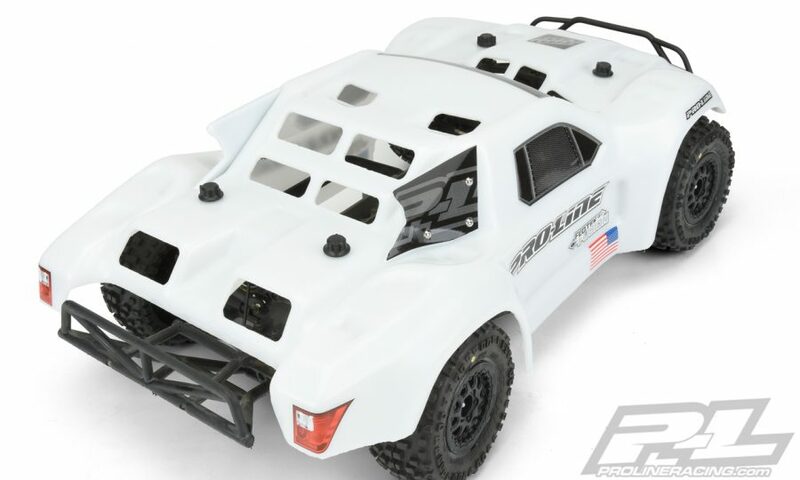 For short course trucks, Pro-Line offers the Pre-Cut Monster Fusion Bash Armor Body (3498-15) and the Pre-Cut Flo-Tek Fusion Bash Armor body (3458-15) shown here. 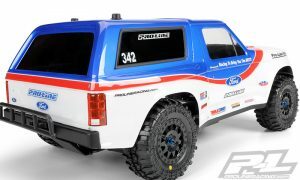 The Flo-Tek Fusion Bash Armor body was designed to be the strongest and most aerodynamically advanced short course race truck body offered by Pro-Line thus making it perfect for this race truck variant of the PRO-Fusion. The Bash Armor material is twice as thick as regular bodies and is extremely flexible to lessen the chance of cracking and shattering. The Fusion Bash Armor body will also help keep the chassis from sustaining the full force from crash impacts. On top of all of that is the Flo-Tek feature which was specifically designed to minimize the short course body parachute effect. An inherent problem with short course bodies is that they act like parachutes when going over jumps, causing you to lose control and crash. This body comes equipped with large vent holes strategically placed to allow air to flow through it. Large vent holes in the front, middle and rear of the Flo-Tek Fusion Bash Armor body gives maximum protection against parachuting. Like the body, the wheels and tires are also not included with the PRO-Fusion SC 4×4. The choice is left to you so that you can select the ones to suit your personal style and desired performance goal. 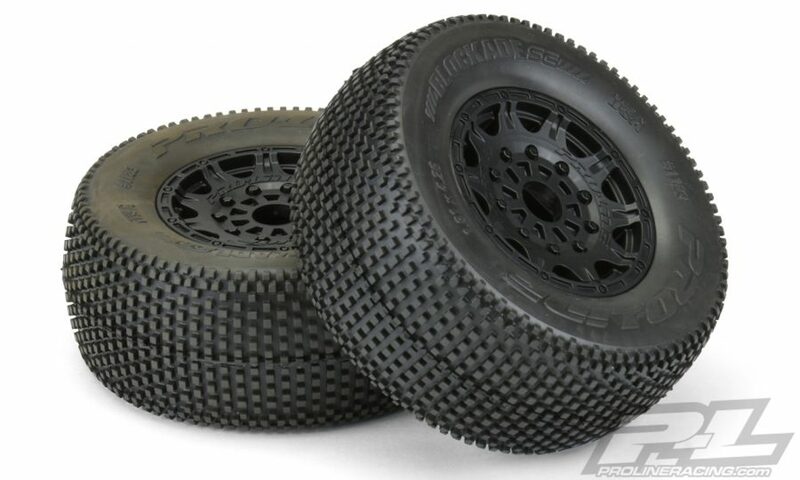 For racetrack duty, Pro-Line Blockade SC M3 mounted tires (1183-24) are a great choice. 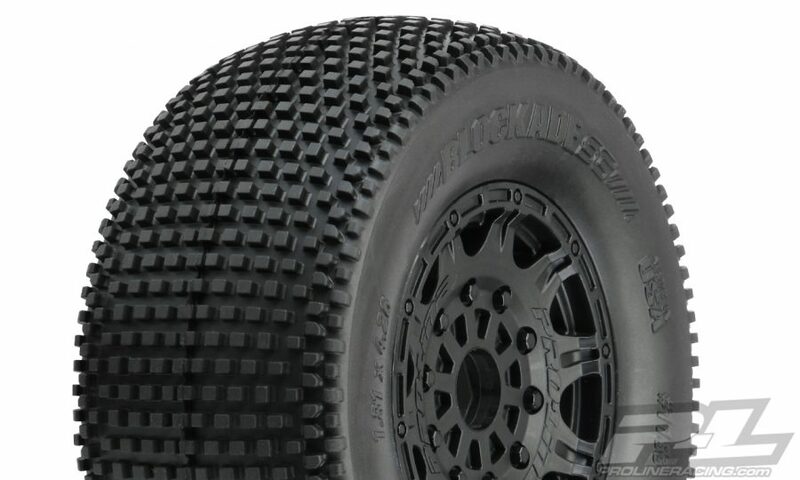 Inspired by the National Championship Winning 1/8-scale buggy tires, the Blockade short course tires provides you with the latest and greatest technology for the PRO-Fusion. 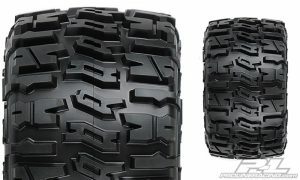 The large lugs offer exceptional tread life along with maximum forward bite and unique side tread to keep you planted in the corners. Testing has revealed that the Blockades can excel in a wide variety of conditions whether the track is loose to loamy and hard packed to blue-groove. 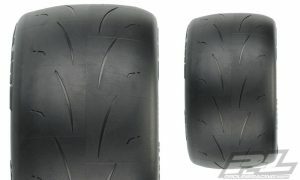 Pro-Line Blockade SC M3 mounted tires (1183-24). 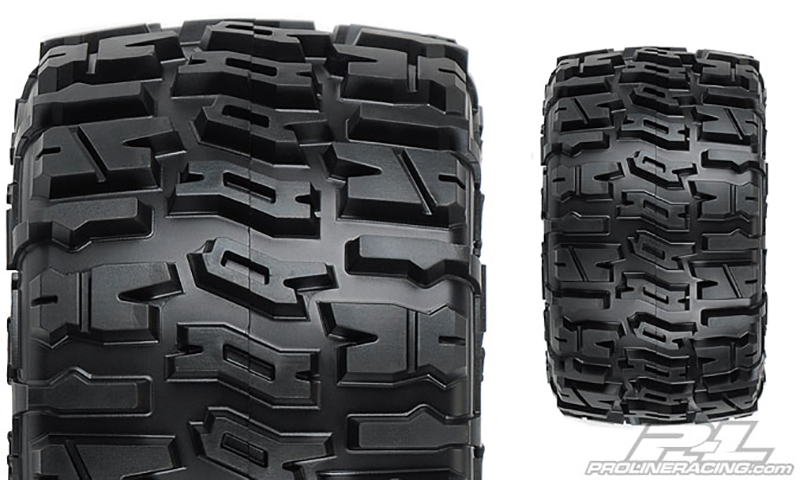 These tires are sold in pairs and come wrapped around the super tough Pro-Line Raid wheels. No gluing is required because Pro-Line already did the work for you. Just open up the bag and install it right onto the PRO-Fusion truck. Part of the toughness is the incorporated 17mm hexes which are stronger and can handle more power when compared to standard 12mm hexes…just the thing for this build. Black Raid wheels have a bold appearance and built tough thus making it a perfect complement for the Pro-Line Blockade tires. Two other option parts we would add to this build are the Pro-Line Aluminum Shock Caps (6318-00) and the Pro-Line Aluminum Shock Mounts (6318-01). They each add strength, durability and style to the PRO-Fusion. 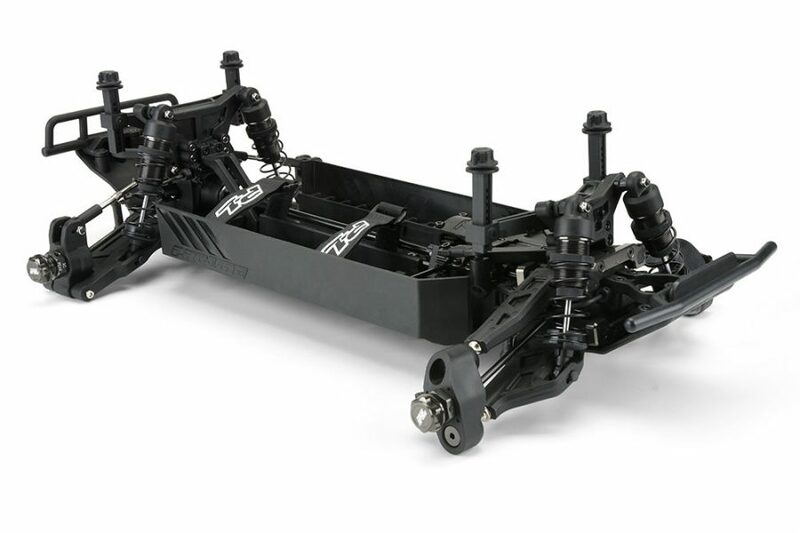 Pro-Line beautifully CNC machines them out of high-quality aluminum that is then anodized gunmetal which will match other parts on the chassis. The shock caps have a large laser engraved P-L logo on the front and back, are sold in pairs and include new inner shock diaphragms. The shock mounts come in a set of four, enough to outfit the truck. Installation of these parts are a breeze as they are direct bolt on parts to replace the stock components. 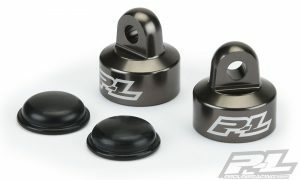 The stock shock caps and shock mounts are made of composite plastic which can be vulnerable to breakage especially on a vehicle that will be tearing up an off-road track. 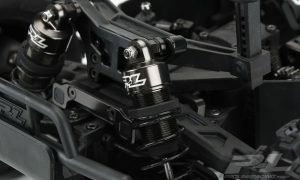 Aluminum shock caps are less likely to come off the shock and the aluminum shock mounts can withstand the severe pounding that the suspension components face. 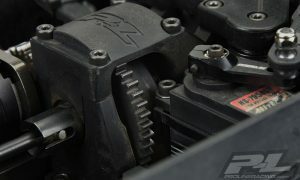 Along with increasing durability to the PRO-Fusion, the Aluminum Shock Caps nicely add to the appearance of the chassis. Hitting the street with the Pro-Line PRO-Fusion SC 4X4 and making it into a sick on-road machine is quite simple yet totally transforms the appearance of this off-road truck. 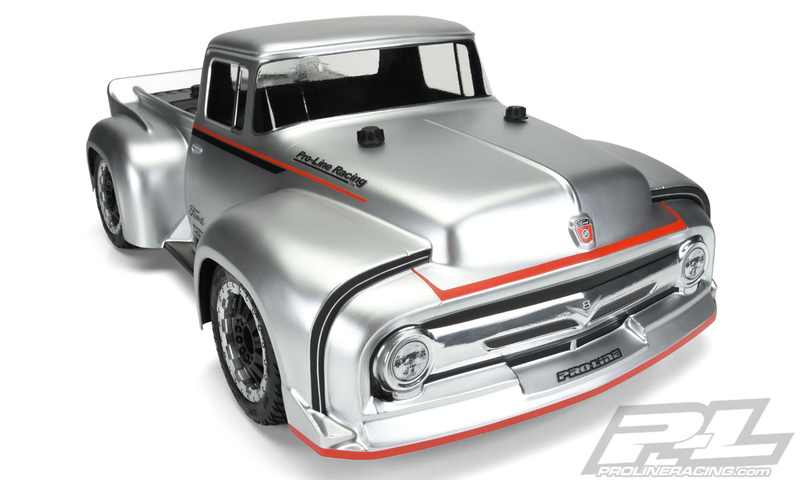 A perfect body to achieve this on-road objective is the licensed Pro-Line 1956 Ford F-100 Pro-Touring Street truck body (3514-00). 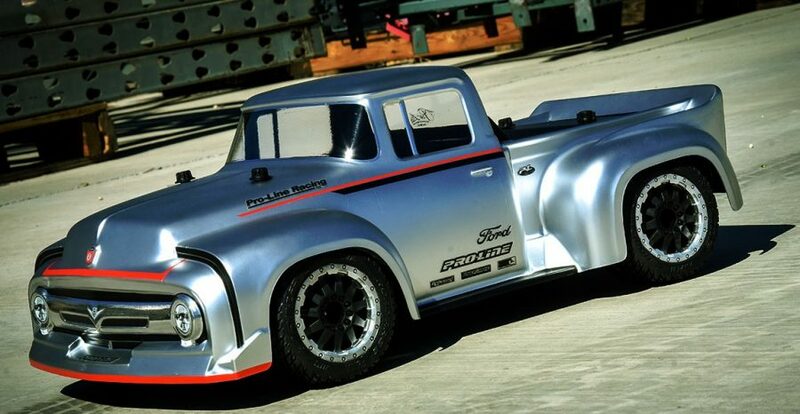 It is designed for short course truck chassis and converts it into a killer-looking slammed retro street racer. 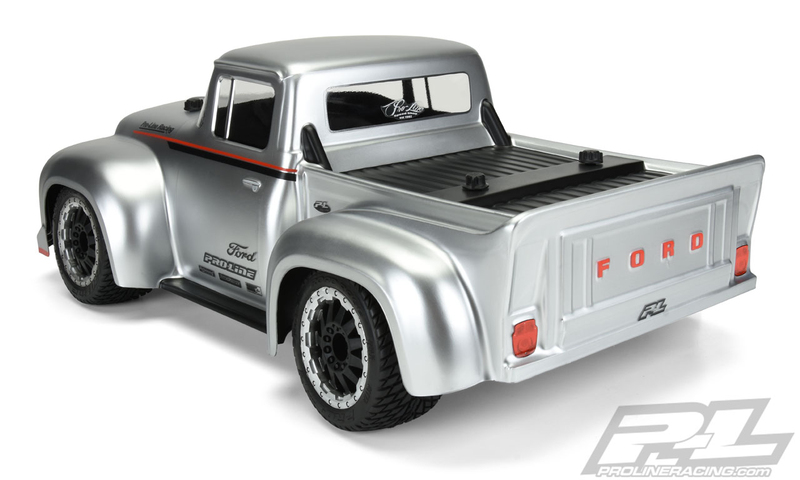 Old school styling of the Ford F-100 body makes it a standout and as expected, Pro-Line did an awesome job with the execution. The scale details like the iconic old-school grill, single cab layout, realistic headlight and taillights all had to work with it also being properly proportioned to fully cover the tires of the PRO-Fusion short course truck. The body even has a built-in rear spoiler which is a telltale sign that this truck is meant to see some high speeds. The Ford F-100 body comes in crystal clear polycarbonate with overspray film and a nice detail decal sheet to make this truck really come to life. Pro-Line 1956 Ford F-100 Pro-Touring Street truck body (3514-00). The old school grill with included stickers make the Pro-Line Ford F-100 standout. Large fenders cover the tires and a spoiler is molded into the rear. The 1956 Ford F-100 body gives this build the proper look for a slammed on-road truck, however the correct tires are required to make sure it has the traction to get the power down to the ground. 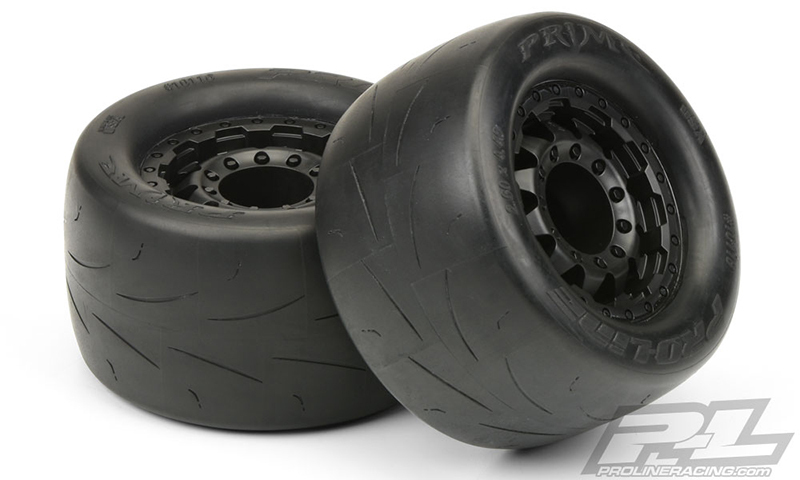 The Pro-Line Prime 2.8” mounted street tires (10116-18) were specifically designed for high speed on-road action. They come pre-mounted on Pro-Line F-11 2.8” 17mm black wheels and will bolt right onto the PRO-Fusion SC 4X4. The Prime 2.8” is basically a slick tire that will put the maximum amount of rubber onto the pavement for outstanding traction. Inherent in the makeup of the Prime tire is the special tire carcass shape that prevents excessive tire expansion on high speed runs while the smooth sidewall allows for controllable slides and burnouts. Pro-Line Prime 2.8” mounted street tires (10116-18). The Prime tires are virtually a slick to offer outstanding on-road traction. In order to mount the Pro-Line 1956 Ford F-100 body on the PRO-Fusion chassis, you will need the Pro-Line Extended Front & Rear Body Mounts (6070-00). 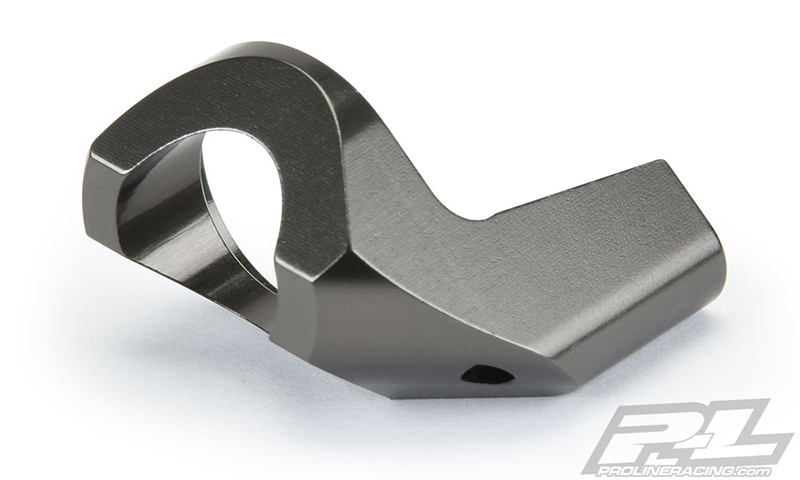 These mounts feature Pro-Line’s Secure-Loc Caps just like the stock body mounts only taller so that you can properly mount the Ford F-100 onto the PRO-Fusion chassis. 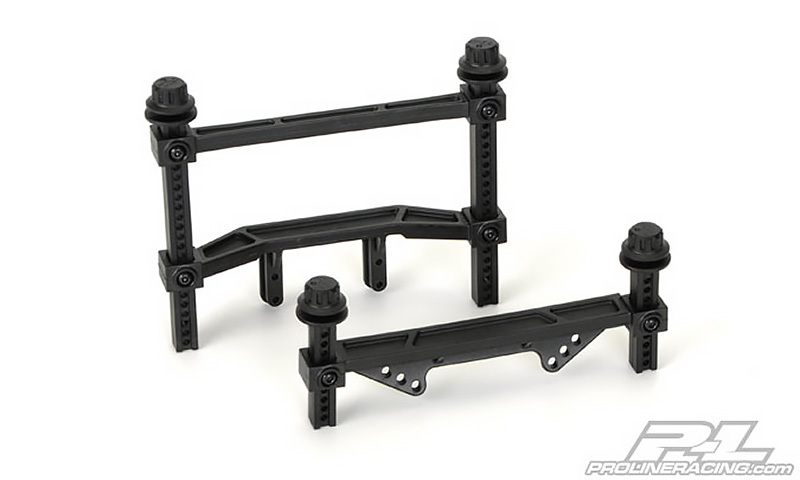 Pro-Line Extended Front & Rear Body Mounts (6070-00). The last part we would add to our PRO-Fusion street machine is the Pro-Line Aluminum Servo Saver (6318-03). It is expertly CNC machined out of aluminum and then anodized a deep gunmetal color that matches other parts on the PRO-Fusion chassis. This aluminum upgrade part is a direct replacement for the stock plastic composite servo saver. It allows you to tighten down your servo saver spring to give the steering a more precise feel…just what you would want on a high-speed vehicle. Pro-Line Aluminum Servo Saver upgrade part (6318-03). 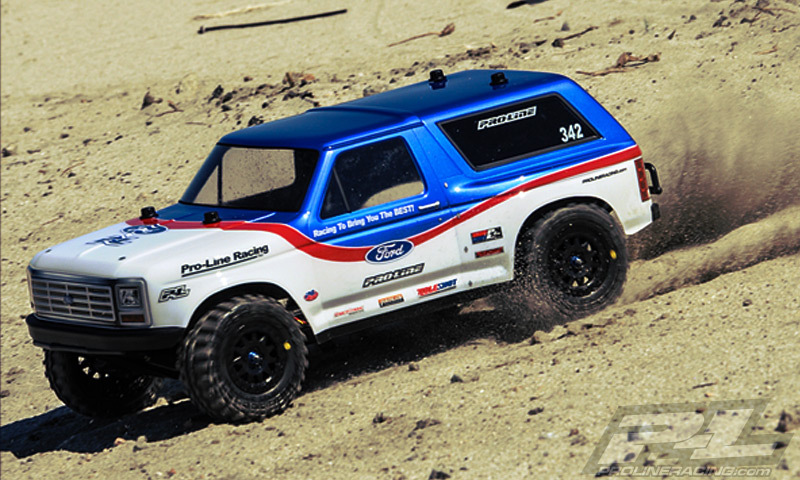 The last build variation for the Pro-Line PRO-Fusion SC 4X4 takes this short course truck and slightly alters it into a desert Baja race truck. 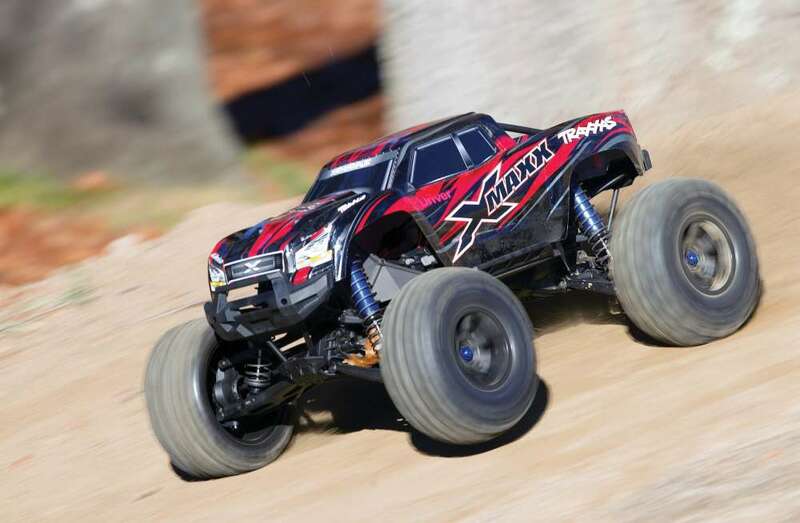 The costly and hard part of converting the PRO-Fusion into a desert race truck is essentially done for you since the PRO-Fusion is so robust with its 1/8-scale race buggy DNA and extraordinary performance. A couple additions is all that is needed to make this transformation. For the body shell, the Pro-Line 1981 Ford Bronco (3423-00) is a great candidate since it is a popular truck among full scale off road racers. Lay down a race-inspired paint scheme along with the included detail stickers and some race livery decals and you have a desert race truck. The SUV shape of the Bronco body is a completely different and distinctive look than most other RC short course trucks out there. 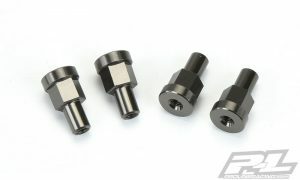 To mount the Bronco onto the PRO-Fusion, you will need to get the Pro-Line Extended Front & Rear Body Mounts (6070-00). 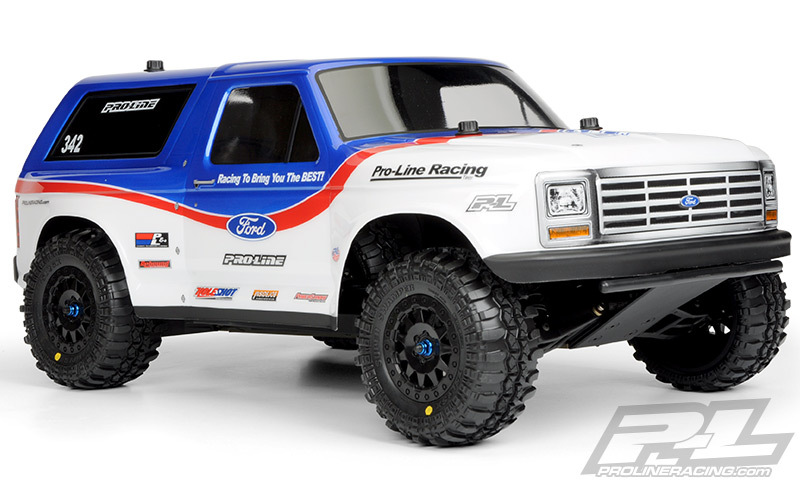 Pro-Line 1981 Ford Bronco (3423-00). A race inspired paint scheme with race livery stickers makes this a great looking desert race truck. Extended body mounts are needed to install this body on a short course chassis. Since a desert Baja race truck will be facing severe off-road conditions, a little tweak to the drivetrain is a good idea. Pro-Line offers a Steel Spur Gear upgrade (6318-02) for the PRO-Fusion SC 4X4. It adds strength and durability to a crucial part of your truck and replaces the stock plastic spur gear. The Steel Spur Gear upgrade is CNC machined from hardened steel and is black oxide coated so that it resists rust. Pro-Line altered the design of the spur gear and made it narrower than the stock gear so that it would weigh less and reduce friction for smooth and quiet performance. 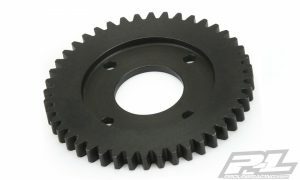 Pro-Line Steel Spur Gear upgrade (6318-02). The Steel Spur Gear is narrower than stock to reduce weight and friction while also being able to withstand serious power. A truck setup for major off-road action needs tires that can handle virtually any type of terrain. We chose the go-anywhere Pro-Line Trencher 2.8” All Terrain mounted tires (1170-18) for this build. You don’t need to worry about gluing the Trenchers because these come pre-mounted on Pro-Line F-11 17mm black wheels. Their design brings a tough and rugged look that nicely compliments the Ford Bronco body. The wheels have a satin black finish and is nicely detailed with lug nuts, molded-in bead-loc ring, 11 triangulated spokes and a scale P-L logo. 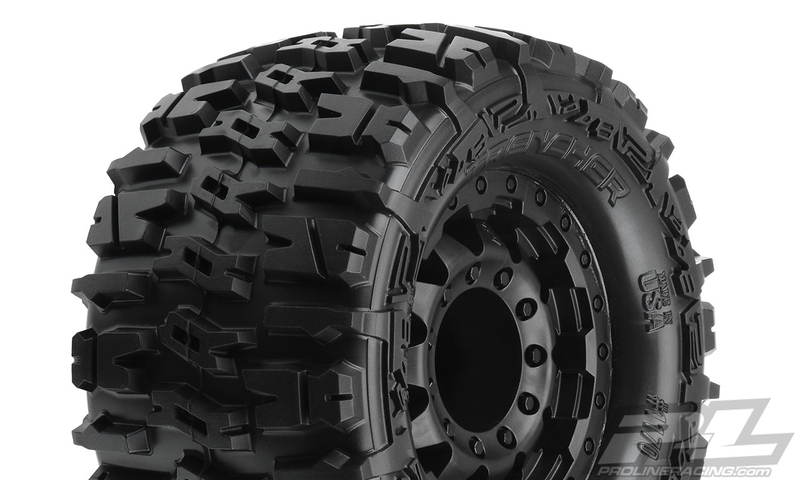 As for the Trencher tires, Pro-Line invested many months of R&D to produce a tire that can handle loose or hard-packed dirt, sand, snow, street or gravel. Extraordinary traction with long lasting durability comes via the special shape of each tire lug that will dig into all types of surfaces and is thick enough to last for a long time. Designed with horizontal H shaped tread for outrageous amounts of traction and side-to-side stability. The last touch on our Baja PRO-Fusion desert build adds scale detail and function when the sunlight starts to fade. 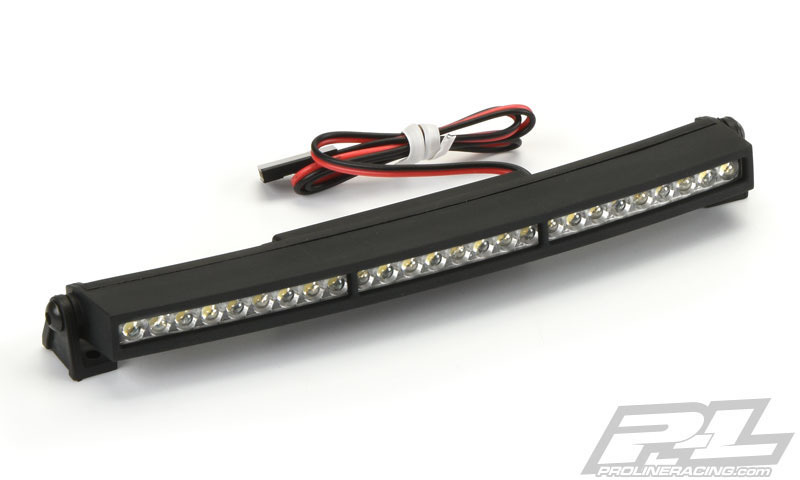 Installing the Pro-Line 5” Super-Bright LED Light Bar Kit (6276-03) is an easy upgrade that makes your truck look more scale while also give you a clear benefit of light for those dark off-road runs. The light bar itself is slightly curved to nicely fit the contours of the body and is manufactured out of durable black Nylon. Inside the housing are 26 pre-wired LED light bulbs along with a 12” long cable that simply plugs directly into a 3S LiPo power source. Pro-Line includes the hardware and mounts to make install a breeze.